Our specialty is to develop HVAC projects (Heating, Ventilation and Air Conditioning) tailored for the client. 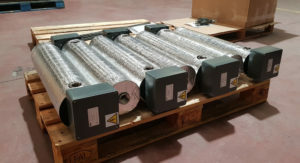 On this occasion, within the transport segment, the railway sector, we highlight the recent special manufacturing that consists of the manufacture of 140 units to 7 kW heaters. These equipment have been designed and manufactured entirely in our facilities, complying with the demanding railway regulation EN150855-2. The main application of these heaters, is to heat water for sanitary use.